Tracy is an accident benefits coordinator & licensed paralegal at the Kahler Personal Injury Law Firm. Tracy has been employed in the personal injury/litigation field for the past 12 years. Her passion for assisting clients and her exceptional technical understanding of the accident benefits regime has provided Tracy with rewarding work exclusively in the area of car accident files. She is dedicated to assisting victims of car accidents with their claims for auto accident benefits. As a licensed paralegal, Tracy has participated in numerous meditations before the Financial Services Commission (FSCO). 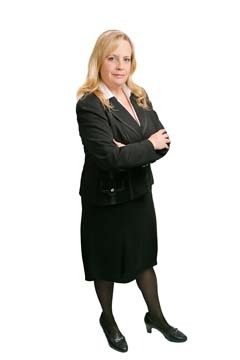 She has worked on and assisted our car accident lawyers Toronto at all stages of proceedings, both before the courts and the Financial Services Commission. Tracy is a regular contributor and speaker at Ontario Trial Lawyer’s Association (OTLA) conferences and has had articles published in The Litigator (an OTLA publication). She is currently the Vice-Chair of the OTLA law clerks section, and a licensed paralegal in good standing with the Law Society of Upper Canada. She is also a member of the Institute of Law Clerks of Ontario. She is the past recipient of the Outstanding Law Clerk Award, presented by OTLA (2007), and the past recipient of the Distinguished Law Clerk Award, presented by OTLA (2008). Tracy has recently developed an interest in local Zumba classes, and continues to be an avid Leafs fan despite their abysmal record. She also plays competitive slo-pitch in her spare time.